Cooler Master reveals a new high-end processor cooler for those who have no desire to use liquid cooling. The MasterAir Maker 8 measures 135mm x 145mm x 172mm and weighs a massive 1350g. The special thing about this heatsink is that it features a 3D Vapor Chamber design. Cooler Master got rid of the traditional heatsink base and replaced it with a coolant filled vapor chamber. When heated, the coolant phase changes to a gas and heat gets transferred from the copper heatpipes to the aluminium fins. Four heatpipes are connected directly to the 3D vapor chamber and the aluminium heatsink features four U-type heatpipes. According to Cooler Master, the 3D Vapor Chamber technology of the MasterAir Maker 8 can keep an unnamed 4.7GHz processor at 64.5°C. This compares to 76°C for horizontal vapor chamber (HVC) technology, 78°C for direct-touch heatpipes and 80°C for a basic heatsink design with copper base. 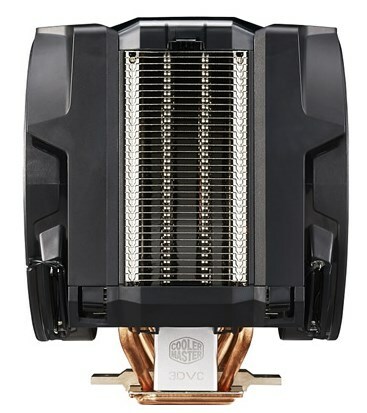 Cooler Master rates the MasterAir Maker 8 at 250W TDP cooling capacity. 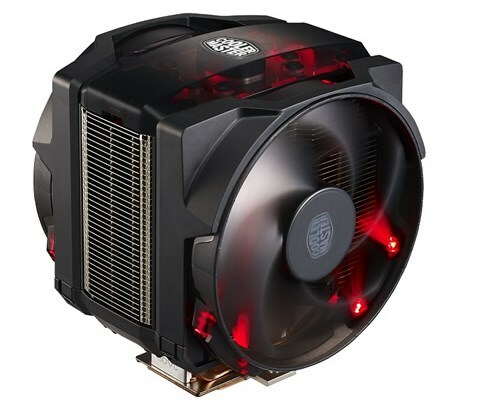 Airflow is provided by two 140mm Cooler Master Silencio FP PWM fans, these units with loop dynamic bearing deliver up to 66CFM at a noise level of 24dBA. The fan bracket supports 120mm and 140mm fans, they can easily be swapped via the intuitive bracket design. The cooler incorporated fancy red LEDs and the design is somewhat customizable, the box contains interchangeable aluminium and translucent top covers. Further customization of the top is possible via 3D printing. The MasterAir Maker 8 has landed. It’s designed for gamers and overclockers who demand ultra-low temperatures, aggressive LED lighting, and total control over their hardware. A seriously sizeable unit bursting at the seams with our newly patented 3D Vapor Chamber technology, your system will look amazing and stay rock solid even during intense gaming and overclocking. And yes, you can customize the outlook with two bundled top cover designs, as well as adjust the fan size, model or position for memory or graphics card clearance. The big shocker perhaps is the pricing of this cooler. It appears the MSRP is a massive $129.99 but Amazon is currently offering it for $118.99.